Pets In Spain Is Not Just Dogs and Cats! The Pets In Spain animal charity has no bounds when it comes to rescuing animals, and it’s not just dogs and cats. A new born lamb, goats, rabbits, birds, hamsters, tortoises, pigs, and an Iguana! 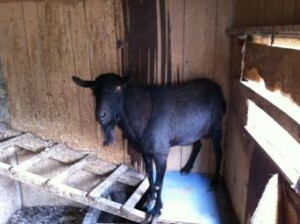 Billy the goat was the pet of a lady and he lived in a big trailer on her plot of land. When his owner died suddenly Billy was stranded on the 20,000 sq meter plot. The local authorities knew he was there and without an owner but they did not respond to pleas from friends of the deceased lady for help in relocating him. There was also the real possibility that once word spread that he was unaccompanied the place would be invaded and he would be ruthlessly killed for food. This is where the Pets In Spain animal charity stepped in. They received a call from the local vet clinic and responded immediately. Taking it in shifts to go to the location of the goat several times each day,to oversee his safety and to feed him, the volunteers were eventually able to effect his rescue by trapping him and removing him from danger. Even better news is that Billy (now renamed Rasta) is re-homed with a young English family on a finca where he has a goat friend for the first time in his life. In Spain there is no organisation like the RSPCA in the UK. Every day the Pets In Spain team receive calls from people asking for help with animals in imminent life threatening situations. Once a rescue is initiated the animal is assured of total care and welfare and readied for adoption, but the charity’s activities are limited due to lack of funding. Their biggest expenditure each month being the ever increasing veterinary bills.